In 79 AD a deadly eruptions ended the history of small but wealthy Roman cities of Pompeii and Herculaneum. Tons of falling debris filled the streets until nothing remained to be seen of the once thriving communities. At least one thousand casts made from impressions of bodies in the ash deposits had been recovered from this magnificent city of Pompeii. But what was a doom for Romans living, gave archaeologist an wonderful insight into the Roman world. We have found jeweler, mosaics, gladiator helmets, medical equipment. But one thing is even more amazing - food. Food carbonized and preserved for almost 2000 years. Bakeries (one on the left) were very popular - about 35 have been found in Pompeii, each supplying their local area: selling directly from the window or delivering. Dough was prepared in a different area. This was not always by hand. 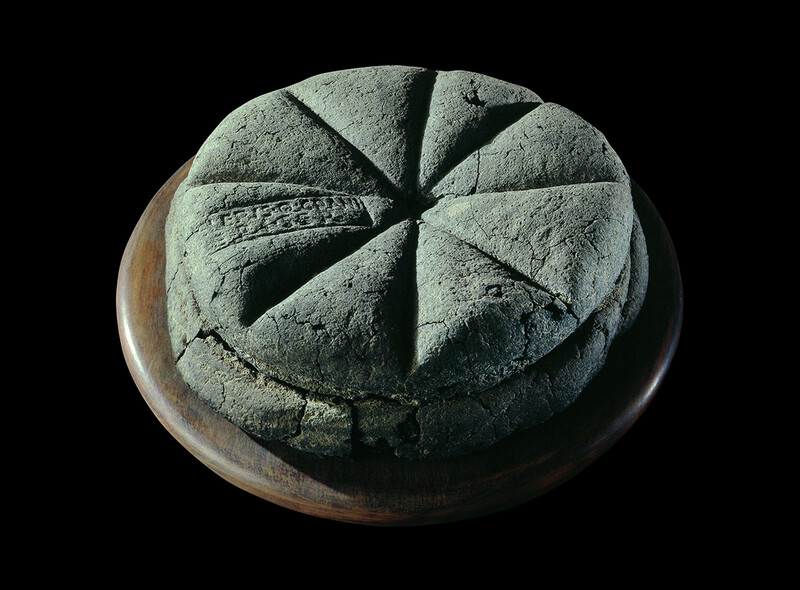 In the bakery of Popidius Priscus, an industrial scale bread making machine was discovered with the dough mixed with large paddles. Machinery was common in Roman baking. Special kneading machines existed. Dough was wound around a horizontal shaft in the bottom of a basin and then pressed between wooden slats in the basin’s sides. Only the shaping and stamping with the mark of the bakery was done by hand. 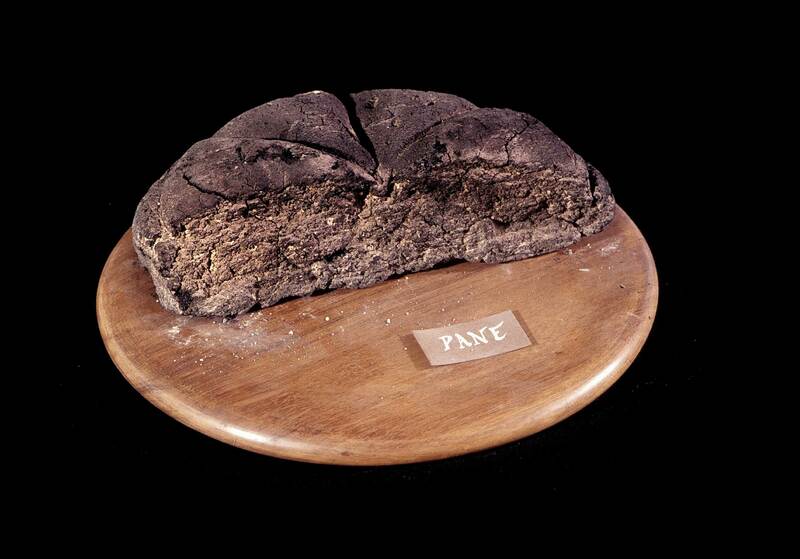 In one bakery, 85 loaves were found left in an oven at the time of the eruption showing the demand for shop brought bread was high. Generally people ate outside [remember that Romans invented hamburger: sicia omentata] - they didn't usually eat at home. 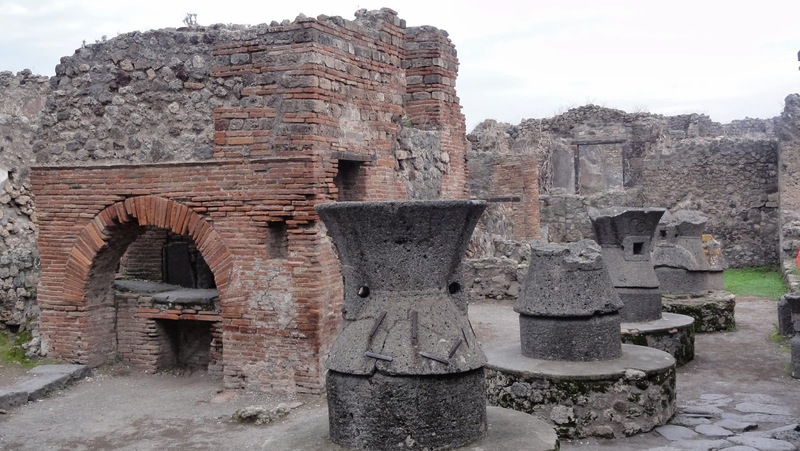 In most of the kitchens excavated at Pompeii (like the one on the left), the only permanent feature left is a masonry hearth with a tiled top and arched recesses at the bottom for storing fuel. Cooking was done on this open hearth, with pots set on iron tripods over burning charcoal or wood. Some houses also boasted a small oven, much like a modern woodfired pizza oven, at the corner of the bench, with a vent near the stove for the smoke to escape. 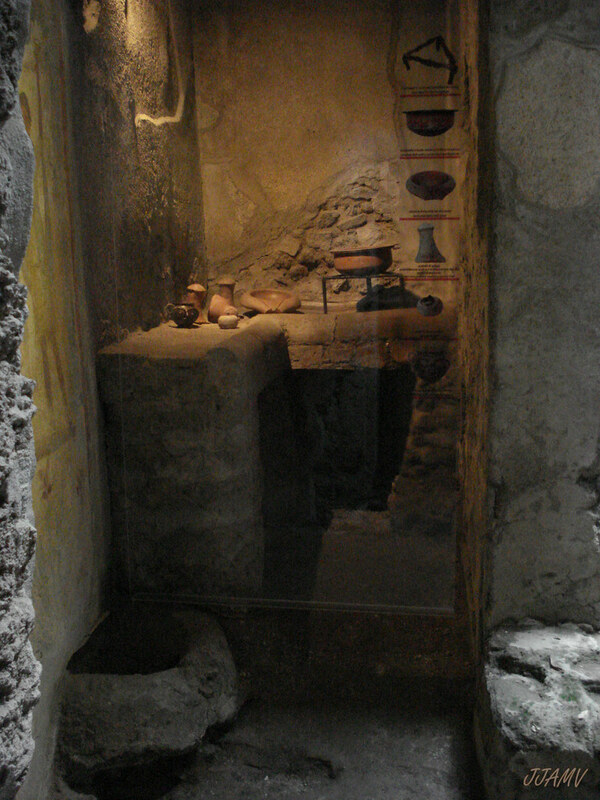 The only other furnishings in the Pompeian kitchen were a basin to hold water for cooking and washing up, and sometimes supports for tables to prepare the food. Texts of the time use the word cacabus to mean pans in general, while the fretale or sartago seems to have been a bronze or iron frying pan. The pultarius was a saucepan, and the testa or clibanus a small portable oven for roasting or baking bread. Iron choppers, knives, cleavers and spoons, as well as strainers, ladles and mortars, were used to prepare the food, which was served on a large circular platter called a discus. What else did they eat? 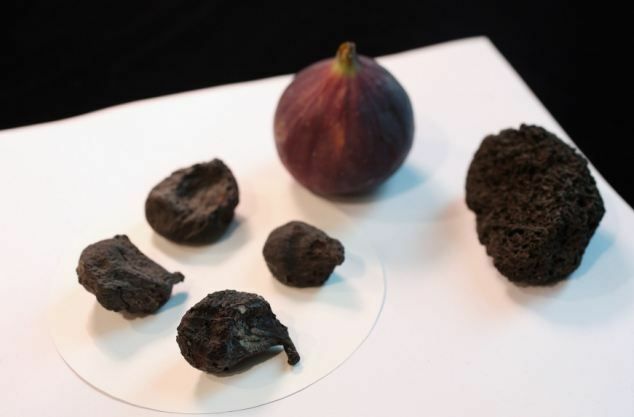 Archaeologists discovered (food scraps found in the drains) remains of food that would have been widely available and inexpensive in ancient Italy, like grains, fruits (like this figs), olives, lentils, local fish, nuts and chicken eggs (real photo). 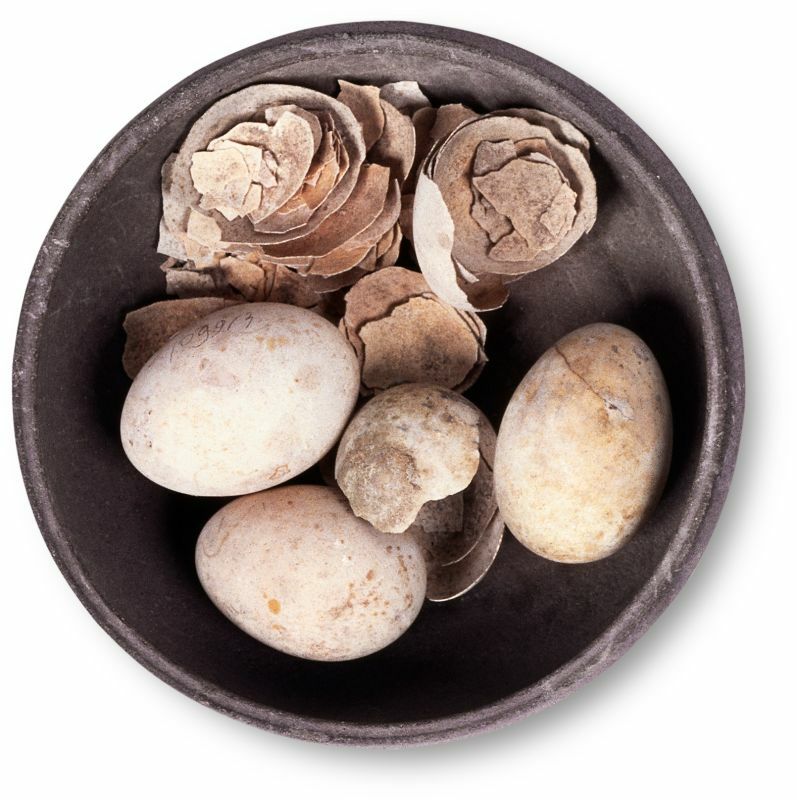 They also uncovered evidence that really wealthy Pompeiians enjoyed a variety of exotic foods, some of which would have been imported from outside Italy, including sea urchins, flamingos and even the butchered leg joint of a giraffe. What's not surprising ancient romans (studies made on the victims of eruption) had perfect teeth' thanks to healthy low-sugar diet. The inhabitants of Pompeii ate a lot of fruit and vegetables but very little sugar. They were strangers to toothbrushes or toothpaste, but their healthy diet meant that few of the Romans suffered from cavities. 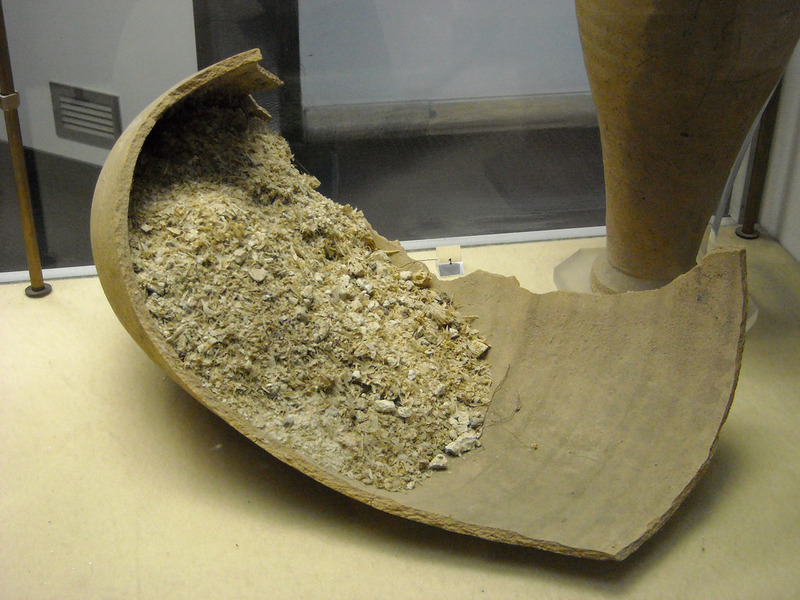 In the months after Vesuvius’ eruption, a lot of Pompeiians came back to dig through the ash and see what they could recover. The Emperor Titus declared Pompeii an emergency zone and offered financial assistance for cleanup and recovery. But the buried towns were beyond salvaging. “When this wasteland regains its green,” wrote the Roman poet Statius not long after the eruption, “will men believe that cities and peoples lie beneath?” Eventually, the towns were dropped from local maps. Within a few centuries, settlers had repopulated the empty terrain, unconcerned with what lay below. They planted grapevines and olive trees in the fertile black soil. You have done a great job on article. It’s very readable and highly intelligent. 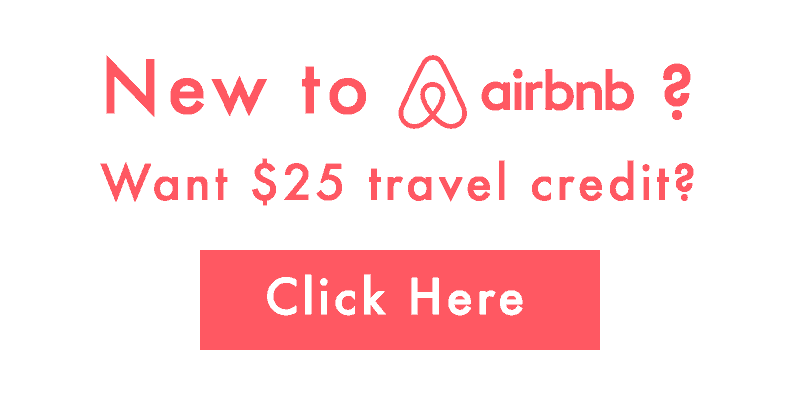 You have even managed to make it understandable and easy to read. You have some real writing talent. Thank you.